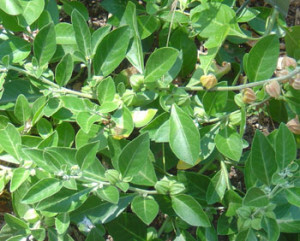 A small evergreen perennial herb growing up to five feet tall with oval leaves and yellow flowers, Ashwagandha is actually a member of the tomato family. As one of the most powerful adaptogenic herbs, its roots have been used in Aryuvedic medicine for thousands of years for its remarkable properties. Ashwagandha’s properties are many, working on the entire body rather then just a single area. Used to relieve stress and anxiety, increase resistance to fatigue, strengthen the immune system, stabilize blood sugar, lower cholesterol, reduce brain cell degeneration, and function as an anti-inflammatory and anti-malarial medicine, it is an extremely vital herb that is loaded with potent antioxidants. Also called Indian Ginseng because of its rejuvenating properties, Ashwagandha helps to protect the body’s cellular structure, as well as the integrity of DNA. Protecting the nervous system, the herb helps to neutralize environmental toxins and boost the entire system when poor nutrition has been the norm. Scientific studies show that Ashwagandha protects brain cells against stress and that it can possibly be a viable alternative when treating Alzheimer’s and Parkinson’s disease. Seeking and destroying free radicals that cause aging and disease, it has also undergone Western research to validate its anti-carcinogenic properties. We advocate avoiding the use of pharmaceuticals for depression and anxiety, as they often cause negative side effects. Instead, using Ashwagandha to eliminate stress is an effective way to treat the nervous system safely. Used in the over 5,000-year-old healthcare practice of Ayurveda, Ashwagandha is often prescribed for increasing energy, stamina, and greater sexual dynamism. When used in appropriate strengths, its properties can be extremely far-reaching, with patients reporting immediate relief of stress, anxiety, low energy, and diminished brainpower. Of course, one of the most essential factors in using the herb is to first make sure of your source. Ensuring that it is grown from a certified organic producer in a completely organic manner will guarantee that you get the most out of its properties. This means that all practices match up to the highest organic criteria, including management, cultivation, harvesting, production, and packaging. If you are buying Ashwagandha in capsule form, the capsules should be made of vegetable material and the contents should be without fillers or additives. A pure product will provide much better results than one of lesser quality. Native to dry areas of India, Northern Africa, Middle East, Ashwagandha is now grown in mild climates, including in the United States. Working with Aryuvedic medicine here at Live Well Holistic Health, we are able to provide you with the best products in order to help you achieve the balance you deserve. For more information on Ashwagandha and how it can help relieve stress and enhance the immune system, call us today at 610 896 1554.